Granite Countertops, created by nature and fashioned by modern technology, are undoubtedly one of the best work surfaces for kitchens, Utility areas and Bathrooms. A granite countertop puts the finishing touch to any kitchen, enhancing the room with a touch of quality and class. At Morgan Murray Stoneworks, all countertops are made to your individual requirements. Our Showroom hosts a wonderful selection of colours, including : Granite, Silestone and other choices of quartz materials. At Morgan Murray Stoneworks, all of our works are carried out to the highest possible standard attainable by our expert staff, who have years of experience in dealing with Granite countertops. 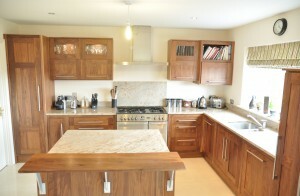 We supply and fit Countertops countrywide and offer a complete service from measuring/template to fitting. The Countertop, edge finish, upstands, splashback, sunken drainers, Draining flutes, sinks, taps, breakfronts, window boards, breakfast bars (standard or with feature curves etc.,) island units, raised shelves. We also cater for shop-fronts, bar-counters, house or wall plaques and fire hearths.